Conducting a prescribed burn at the New York Wildfire & Incident Management Academy in the fall of 2015. In the world of wildland firefighting, there are vast acreages of uninhabited fuel-filled forests out west, with a well-trod history of fire and management, and then there are areas known as the WUI, the Wildland-Urban Interface, a quagmire of human dynamics and its attendant politics, where only the bravest venture. In its simplest terms, the WUI is the area where human settlements abut large swaths of wilderness. A forest fire in the wilderness can be contained through methods ranging from cutting fire lines around an existing fire, which breaks the fire’s fuel supply, to burning areas ahead of the fire, in the hopes that lack of fuel will cause the fire to peter out. Those methods prove less-than-ideal when human homes are in the path of the fire. Because of its dense population in the midst of the fire-dependent Pine Barrens, Long Island’s wildfires happen on the edge of the WUI, making our wildfire management a patchwork of response primarily from volunteer fire departments, intent on their mission of protecting human life and property, and from foresters trained in the role of fire in the ecology of the wilderness. The human dynamic of the WUI has made wildfire firefighting on Long Island an aggressive enterprise — fires are put out quickly to protect the public safety, but deep within the forests, fuels are piling up in the absence of a normal cycle of burning, increasing the potential severity of future wildfires. Foresters see these as a prime case for the necessity of prescribed burning, but on Long Island, this still remains a controversial suggestion. The Central Pine Barrens Planning and Policy Commission, the New York State DEC and the North Atlantic Fire Science Exchange are hoping to change the way the public and local fire departments think about fire management in the pine barrens. They opened up the discussion with a two-day conference titled “Keeping the Pine in the Pine Barrens” in early May at Brookhaven National Laboratory. 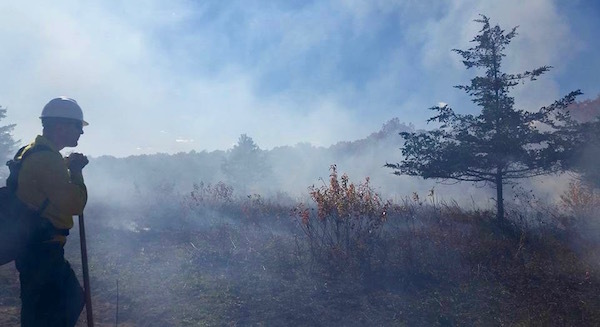 “We are hoping to raise awareness of the need for prescribed fire, and the role it plays in ecological restoration and reducing the fuel that helps fuel wildfires,” said John Pavacic, the executive director of the Central Pine Barrens Joint Planning and Policy Commission, who helped organize the conference. Long Island’s pine barrens are a globally rare ecosystem that is dependent on fire, which helps to maintain habitats for unique and rare flora and fauna. Today, these natural communities have been altered by development, fire suppression, safety efforts, and new threats such as the southern pine beetle. Over the past three decades, there’s been much work done nationwide on making prescribed burns safer, and many of the speakers at the conference shared a wealth of experience-based knowledge. “There isn’t enough fire, for a lot of reasons. The longer between burns, the harder it is to get it done right and safely,” said Dr. Bill Patterson of the University of Massachusetts-Amhurst, one of the pioneers of prescribed burns. Dr. Patterson said there’s evidence that Native Americans used controlled burns to open up pasture and farmland long before settlers arrived on these shores. A controlled burn conducted by instructors and students at the New York Wildfire & Incident Management Academy in Calverton in the fall of 2015. Up near Albany is a 3,200-acre park called the Albany Pine Bush Preserve, an ecosystem very similar to Long Island’s pine barrens, where forest scientists have been researching the effect of prescribed fire for nearly three decades. Neil Gifford is the conservation director of that park. “Fire is as inevitable and essential as rain and sunshine” in a pine barrens ecosystem, he said at the conference. The park, which is the largest inland pine barrens east of the Rocky Mountains, is also home to the rare Karner Blue Butterfly, first discovered there by novelist Vladimir Nabokov. The Albany Pine Bush, with areas of WUI interspersed throughout the pine barrens, is also a good microcosm for the human dynamics at play in Long Island’s pine barrens. 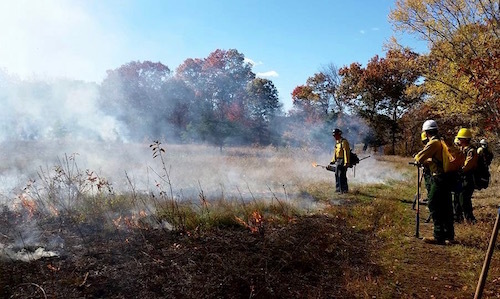 Mr. Gifford’s commission has been experimenting with prescribed fire to manage the ecosystem there since 1991, dividing the preserve into a checkerboard of unmanaged areas, areas where they mow grasses and areas where they both mow and burn. They’ve found that prescribed burns are best done in the summer, when green plants slow the spread of the fire. “Our goal is to expose mineral soil. It’s like peeling off the layers of an onion, year after year,” he said. He says prescribed burning keeps the pine bush healthy, and will also make the preserve more resilient in the face of climate change. Conservation ecologist Tim Simmons pointed out that the population of Datana moths and other pine barrens species, evolutionarily adapted to fire, exploded after the 1995 Sunrise fires on Long Island, which burned 7,000 acres and is named for the fact that it crossed Sunrise Highway at the height of the blaze. While prescribed fire can be controversial, the attendees agreed that public outreach is essential. “In forestry school, you were taught to hide, but you can’t hide smoke,” said Dr. Paterson. Mr. Simmons said animals often escape fire, by running away or burrowing underground, and the advantages to the ecosystem often outweigh the small number of animals that may be killed by fire. “It’s not really as destructive to wildlife as people think,” he said. 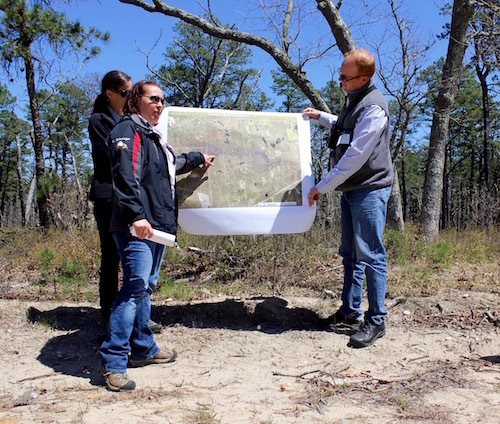 The Central Pine Barrens Planning and Policy Commission has begun outreach to communities within the Wildland-Urban Interface, particularly in the areas surrounding Ridge, Manorville and Calverton, which suffered numerous wildfires in 2012, the most severe among them being the 1,200-acre Crescent Bow Fire. Judy Jakobsen of the Pine Barrens Commission has been charged with public outreach to communities in the central pine barrens, and helped the communities of Ridge, Manorville and Calverton put together a Community Wildfire Protection Plan, aimed at helping residents make their properties fire-resistant. The CWPP has federal funding through the Healthy Forest Restoration Act of 2003 to allow Ms. Jakobsen to do site assessments of houses in those communities, offering suggestions for how to make the properties more safe. Ms. Jakobsen said her site assessments include asking homeowners to not plant evergreen foundation plantings, to clean all leaves from the 30-foot area surrounding their house, and to not install wood fencing that can act as a fuse leading up to houses. She also recommends that people clean leaves out of their gutters and screen the vent openings on their homes. Ms. Jakobsen said she’d like to expand the program to other areas in the pine barrens, if federal funding will allow. She recommends residents go to www.wildlandfirersg.org for more information on how to keep their properties safe. Kathy Schwager gives an overview of the destruction of the Crescent Bow Fire on BNL grounds at this May’s conference. Kathy Schwager of Brookhaven National Lab’s Environmental Protection Division, has long been an advocate of prescribed fire on the grounds of the lab. On April 9, 2012, the Crescent Bow Fire ignited on the lab’s grounds, driven by heavy winds, burning through 246 acres in 45 minutes, in an area that hadn’t burned in 70 years, she said. By the time it was over, the fire had burned through 1,200 acres. “It was an intense fire, a dormant season fire, and there was nothing left,” said Ms. Schwager as she led conference attendees through a portion of the lab’s grounds that burned that day. at the lab.The New York State Wildfire and Incident Management Academy, which celebrates its 20th anniversary this October, first convened on the Brookhaven Lab campus in the aftermath of the Sunrise wildfires. The lab’s original plan was to use classes at the fire academy to do controlled burns on its grounds. At the time, said Ms. Schwager, the plan was to help clear the forests of oaks devastated by the gypsy moth. That led to a greater debate over the role of natural succession in forests, in which oaks would eventually overtake pines if left on their own. “Most (animal) species of greatest need are dependent on the early successional stages,” added Mr. Green. In the midst of this debate about fire, the Southern Pine Beetle, long a menace to pines in the southeastern United States, has been munching its way through Long Island’s pine barrens since at least 2014. DEC forester John Wernet was called to Long Island to help manage the pine beetle problem, after the region was without a DEC forester for seven years. He found a densely packed forest here, deprived of its cyclical fires, with many unhealthy trees unable to grow tall enough for their crowns to take in the sun’s rays. Mr. Wernet said the dwarf pine plains in Westhampton, in particular, are a globally rare ecosystem that is at its healthiest when exposed to fire every six to 12 years. Mr. Wernet is preparing for a prescribed burn in the Rocky Point Pine Barrens State Forest later this year, an area where the DEC cut many trees infested by the Southern Pine Beetle. It would be the DEC’s first woodland prescribed burn on Long Island, where previously they’d only managed grasslands through prescribed fire. The original pine beetle clearing project was the subject of intense media scrutiny when the DEC put out a bid to sell the trees, leading to accusations from the press that the DEC was attempting to profit off of public lands. But, with no market on Long Island for the trees, no bidder came forward to cut the infested trees, and the DEC ended up doing the work instead, using $513,000 in grant funding. “Maybe the pine beetle is a weird blessing in disguise, which gets us to where we need to be,” said Ms. Schwager. “It seemed a lot of people gave up hope. We have momentum again,” said Mr. Green.